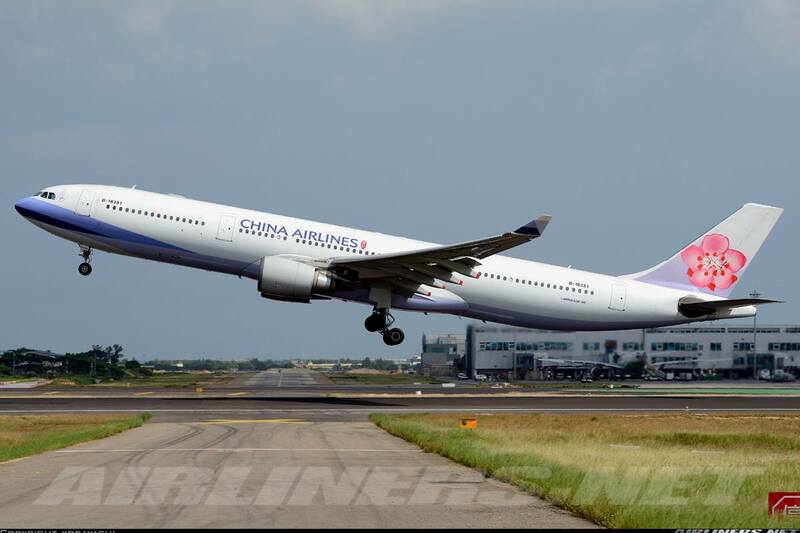 Welcome to my China Airlines Trip Report Part 1! This is China Airlines' Boeing 777-300ER, the aircraft I wanted to fly on. This was my 2nd time flying with this carrier. 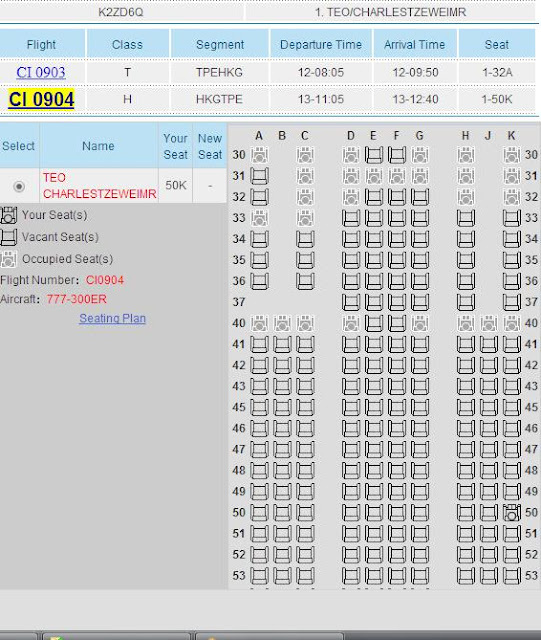 I booked with this airline because at that time I checked the schedule, the flights I picked were operated by Boeing 777-300ER and also because the airline was offering special fare during that period. 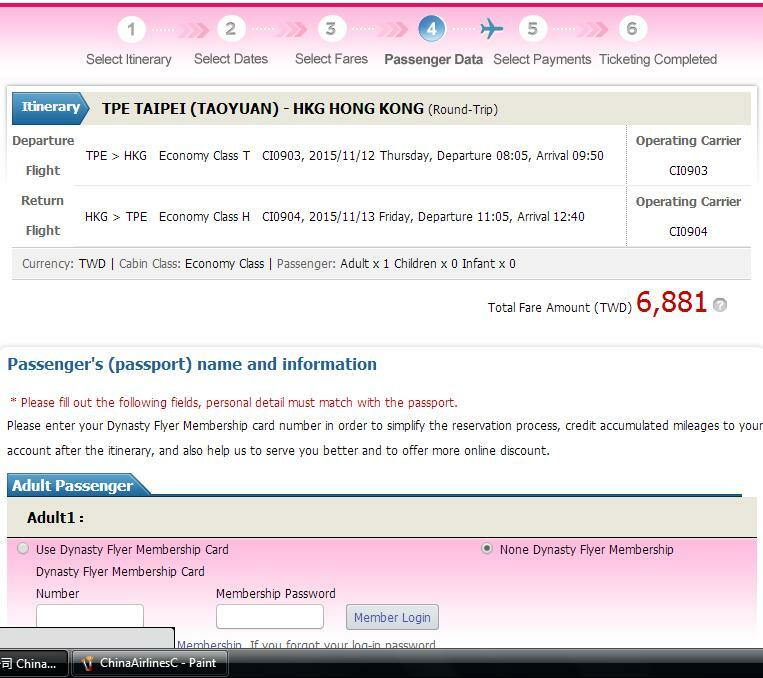 Low fare + Boeing 777-300ER, how to resist? Unfortunately 2 weeks before my flight, I received an email from the airline of the aircraft change for both flights. My original outbound flight was CI903 and the flight aircraft was changed to Boeing 747-400 while my return flight CI904 was changed to Boeing 737-800 and this was one of the worst aircraft changes in the history of my flight logbook. Since I had flown on the Boeing 747-400 and I didn't want to depart that early, I took a gamble by changing my flight to the Airbus A330-300, hoping that I could fly on one of the Airbus A330 in special liveries. On the return sector, I wanted to change my flight to the Airbus A340 flight but unfortunately it was full, and seats were only available on the last 2 flights of the day which were quite late. So I took the gamble and stick to CI904, hoping the airline would change it back to the Triple 7. 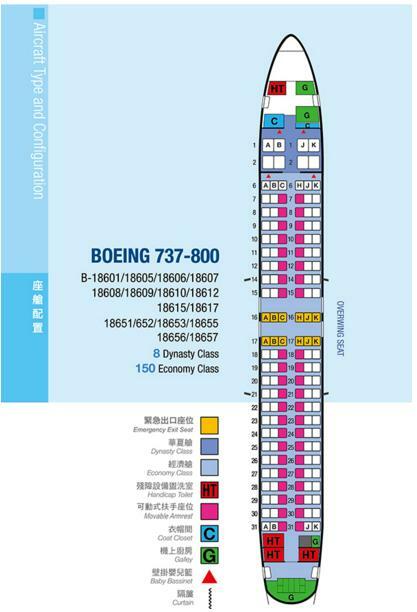 This was my original aircraft - Boeing 777-300ER's seat map. 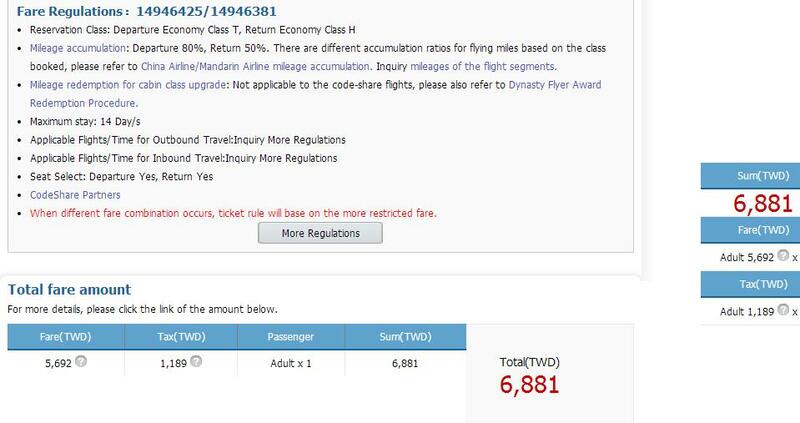 I was able to select premium economy class seats. Was so excited about it until I received that dreadful email. 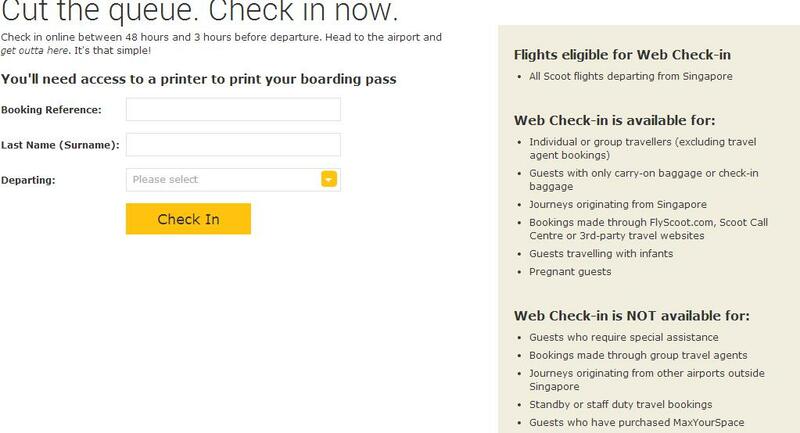 The airline's website has been updated with new features such as additional services, useful for travellers. 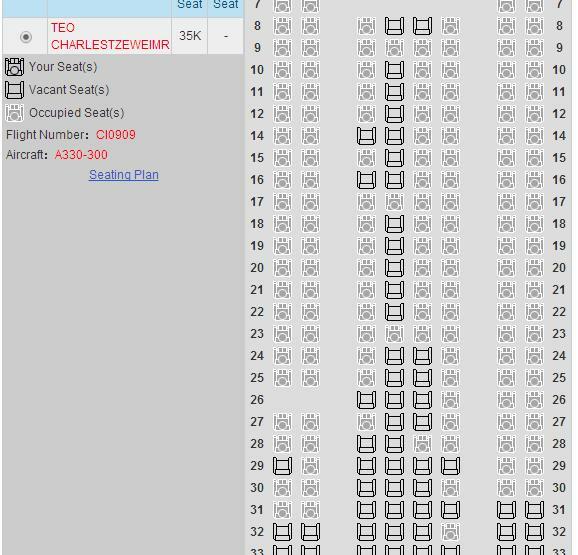 I had a look at the seat map once again by using the seat selection option on the main page. This was my seat for the return flight. I planned to fly both Economy and Premium Economy classes for the experience. Sadly, the aircraft changed and I changed my outbound flight to a later timing, CI909. On my return flight, I was flabbergasted that the Boeing 737-800 was operating. Looking at this only made me depressed at that point of time. Did my online check-in for both flights, sadly my wish was not granted. 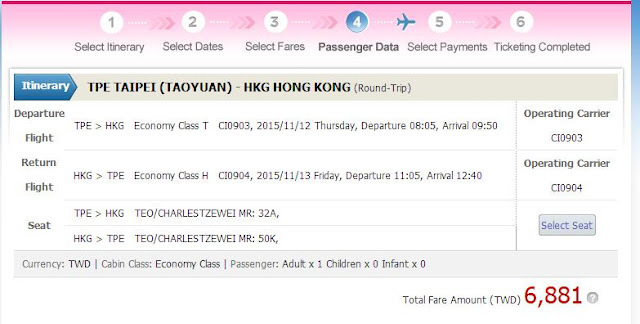 Comparing this website to EVA Air, EVA Air's is more user-friendly for both mobile app and website. 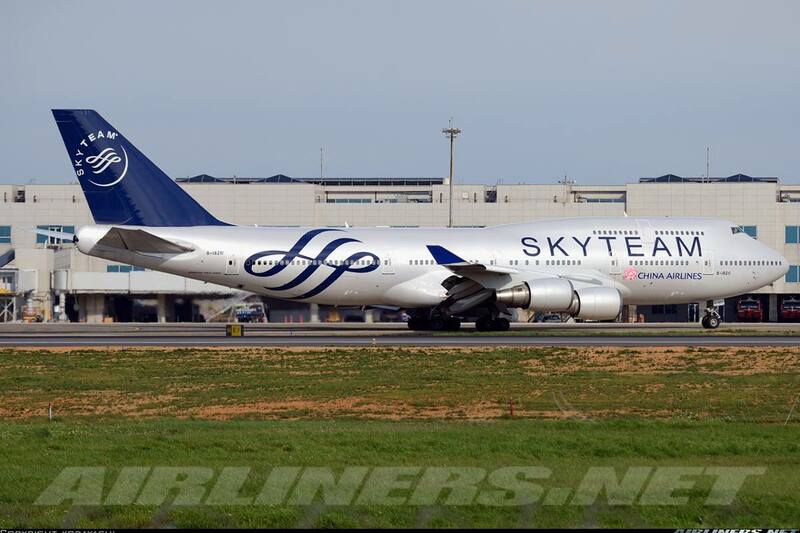 If I had gone for the CI903 flight, I would have flown on the ex-Skyteam livery Boeing 747-400. 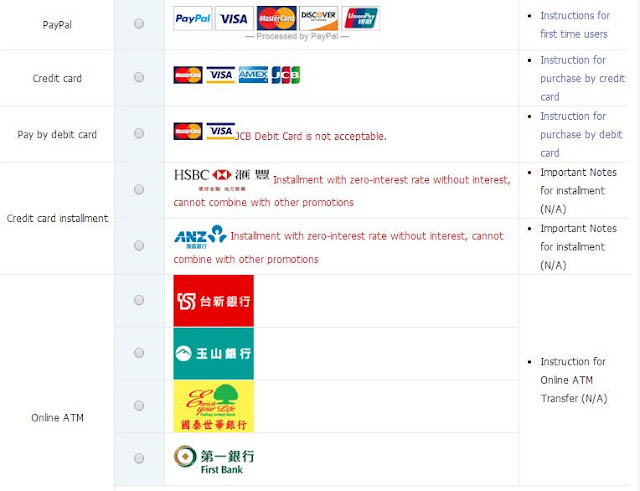 Why did the airline remove this special scheme? I have no idea. B-18206 used to spot this livery, but now B-18211 has taken over. I stayed at the hotel in Taoyuan so that it would be faster for me to get there and I didn't have to check out earlier comparing to staying in central part of Taipei. I got up around 7 and left not long after, took the bus 706 at the bus stop outside Kaohsiung Train Station to the airport, the ride was around half an hour. The night before, I enjoyed a nice Japanese meal. This Japanese meal cost around NT$220 - quite reasonable. After that, I went to 7-11 to grab myself a couple of beers to enjoy at the hotel. Have you tried these before? Breakfast was served at 7 am, and I got up in time to boost up my energy level before heading out. A cup of coffee to start off my day! After that, I took the bus to the airport. Once there, I did my check-in which didn't take long then I went to have my breakfast. Checking my flight to see if there are any delays, no problem. 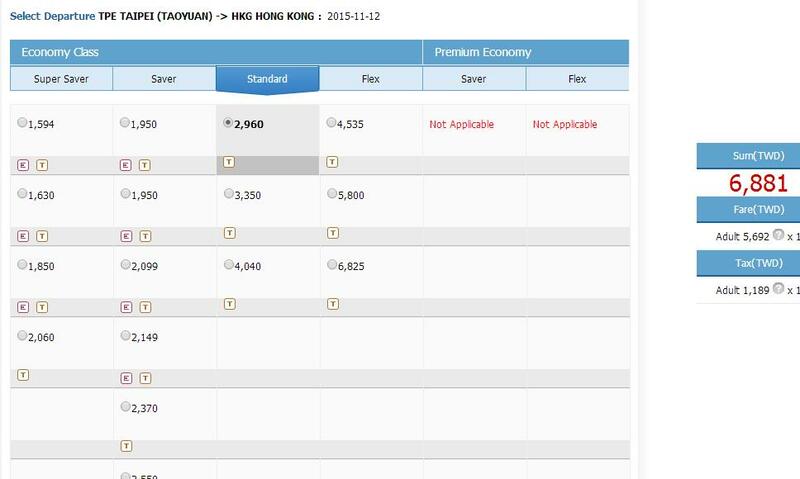 As you can see there are a number of flights to Hong Kong by Cathay Pacific! 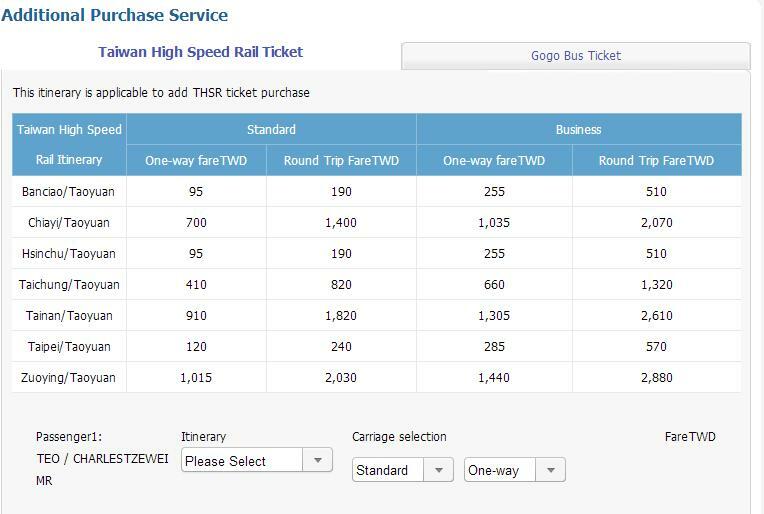 This shows how popular this destination. This row of counters was not in used. A few minutes of queueing up and I got my boarding pass. No questions were asked about my return journey to Singapore. Time to made my way to the air side. Grabbed myself a cup of coffee at Starbucks. After that, I was on the way. Pointless to have escalators over here since its like only a few steps? This is the air side, plenty of duty-free shops. Hello Kitty shop - the fans would go crazy over this one. My flight was departing from gate A2. Since my aircraft was departing from its home base, I decided to check on Flightradar on the status of the Airbus A330 with special livery, only 1 of them was in Taipei and unfortunately, it was flying somewhere else. B-18351 was my ride to Hong Kong, it flew in from Hong Kong and would make a quick turnover back to the same destination. Disappointed? Yes, I could have been happily on board the airline's Boeing 777-300ER. This is where A1-A4 boarding gates are located. Luckily not all the gates are in used otherwise it would be very crowded. CI909 - That's where my aircraft was parked at. There is a TV screen in this room showing a video of how this decoration was being done. Different zones to make boarding a smooth affair. If I flew on my original flight, CI903, I would have been on this aircraft. Checking Flightradar24, B-18351 was taking me to Hong Kong. B-18351 was on its way back while waiting at the gate. The room gets crowded as the departure time was closer. Boarding took place about 20 minutes later due to the late arrival of the aircraft. 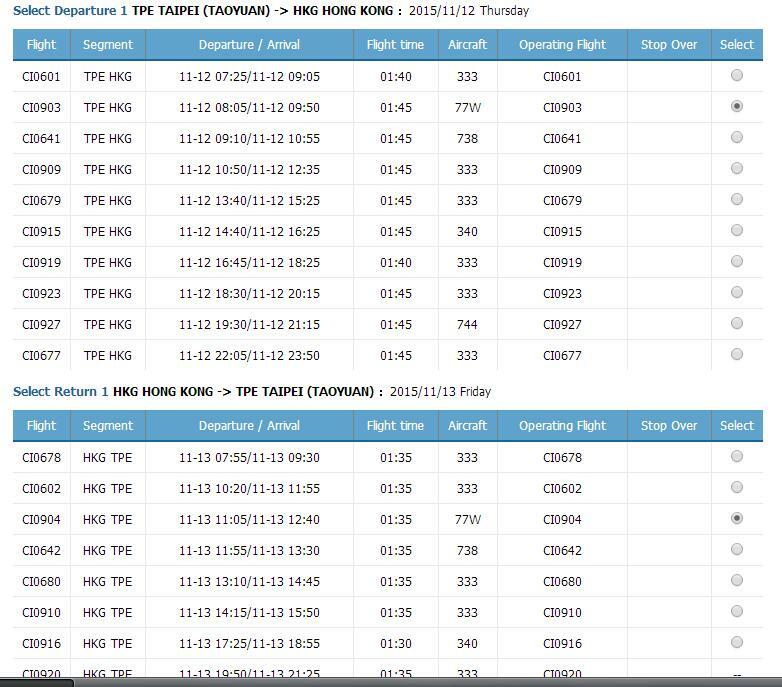 I expected further delay due to the single runway operation at Taipei Taoyuan Airport as the 2nd runway was still closed for upgrading so that the Airbus A380 can land and take off at this airport. Emirates has plans to upguage its Boeing 777-300ER to the Whalejet and that can only happen once that runway is done. Anyway, boarding took place according to the zones each passenger is allocated to. I was in zone 1 so I got to board after the priority passengers. 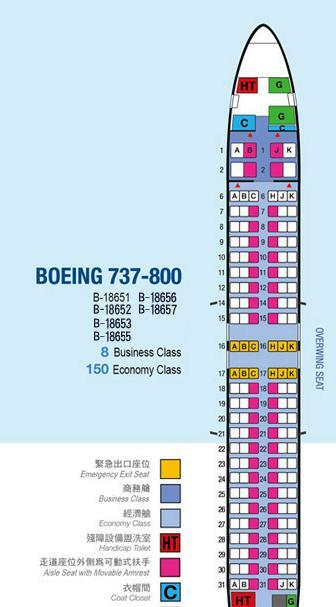 The cabin of the Airbus A330 is the same as the Boeing 747 - outdated. I don't think the airline will refurbished the A330s as the A350s will be coming soon and will replace both the A330-300 and A340-300 aircraft. I always look forward to boarding an aircraft especially the ones I booked myself for. 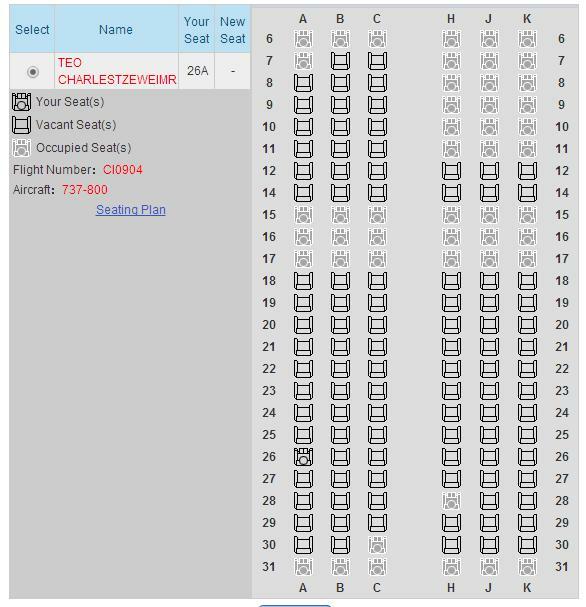 This is the 2-2-2 seating configuration Business Class product, but its pretty dated compared with the other major airlines. However, I find it to be decent enough for short hops but anything longer, I would prefer flying on a better J class product, like EVA Air's. 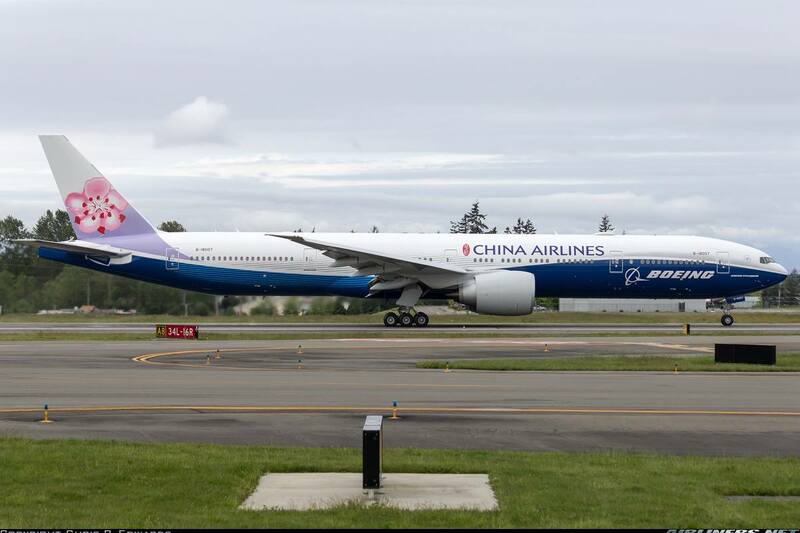 Airfare on China Airlines can be quite pricey and if you can select which aircraft to fly on, I would recommend the Boeing 777-300ER, the newest toy in China Airlines' inventory. All window seats have windows so no worries about windowless seats. Seat pitch looks good, these seats are angled-flat bed. I photographed these photos after arrival. The crew on the right is wearing the new uniform. The cabin is configured in a comfortable 2-4-2 layout, common among the premium carriers. 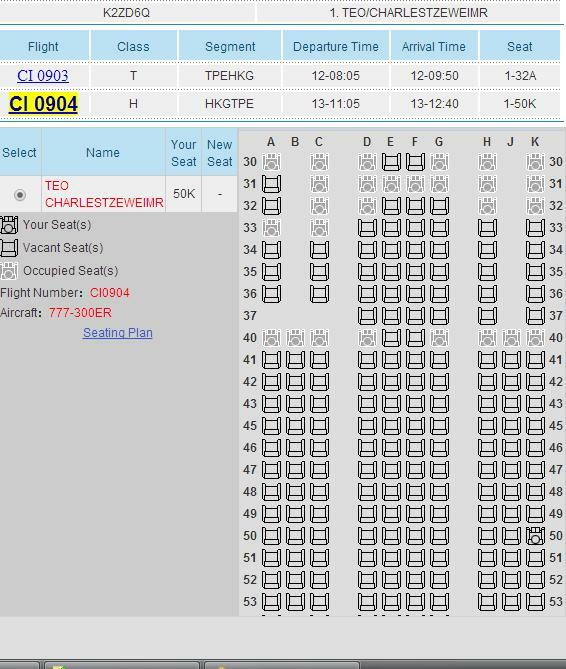 There are 3-3-3 seating configuration but that is among the Low Cost Carriers such as Air Asia X and I can imagine how tight the seat width is for each passenger. The cabin turned out to be 100% full. The bulkhead row with more legroom space, suitable for a family of 4 with an infant. 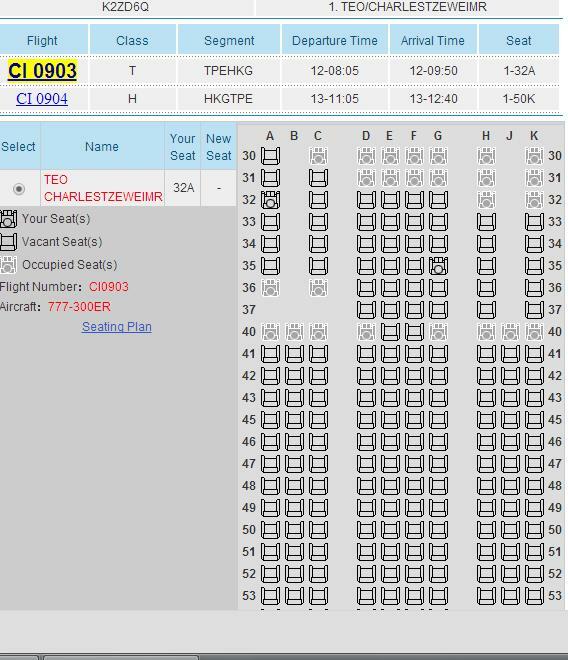 That's probably an advantage of flying Airbus A330/A340 family, no middle seat. When travelling alone, I will definitely choose the window seat. This is my seat, unfortunately my seat mate turned up a short while later. Legroom space is adequate for regional routes. Photo taken from where I was sitting. 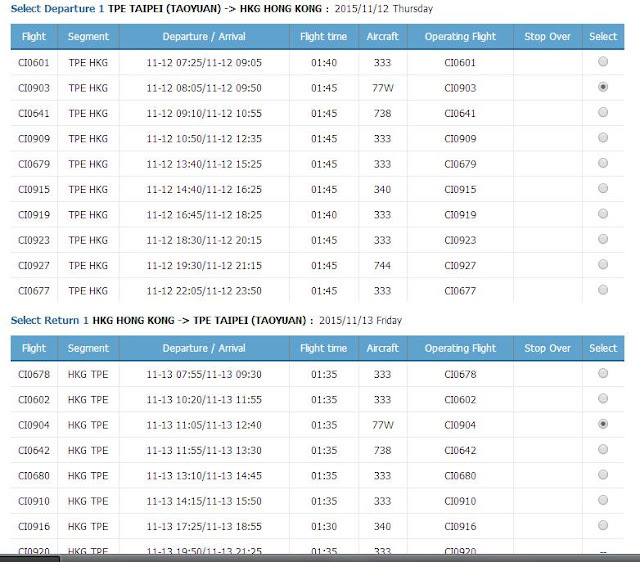 Many Taiwanese and Hong Kong passengers fly on this golden route every day, as the aircraft are often filled up. The Economy Class product is outdated and needs to be upgraded to compete with its fiercest rivals. Legroom space is a bit tight. Its around 31' inch if I am not wrong. Safety card is allocated at the a separate pocket from the others. The bottle water can be placed at the little pocket besides the TV screen. At least there are some popular movies in the selection menu. I was surprised the system has this feature! The map of my flight journey - details of the flight info is limited. The seat pocket is stacked with lots of magazines! Safety card - the aircraft type will be shown on it. What's on the IFE screen? Every month, the airline will update its system with new movies. A bag was distributed to each passenger. It consists of a pork bun (no other choices), a Taiwanese snack, a wet towel and a bottle of water. The pork bun is quite delicious! By serving a snack bag instead of a full meal tray saves the crew a considerable amount of time especially if the flight is full and the short duration. I am not sure what Taiwanese snack is this but I like it. Overall, I am satisfied with the snack and there was no hurry to finish the snack meal quickly. I was quite pleased with this set of crew as they welcomed each of us on board. Unlike my previous experience, they greeted us while we were on our way and a few were seen assisting some passengers. The crew apologized for the delay and wished us a pleasant flight and once the safety video was done, they came around to prepare the cabin for departure. On this flight, the changes compared to my last is that this time the airline allowed the use of electronic devices only if they are in in-flight mode so taking photos in the cabin or listening to music is not a problem. That's great! Aircraft pushed back, engines started and we were on our way. It felt like eternity lining up at the single runway and finally we took off in good weather. There was turbulence during the flight but nothing bad, got a bit of shaking while descending into Hong Kong, however the landing was smooth. The in-flight service was good and everything went well. This set of crew were professional and I like the way they go around checking that everyone was comfortable and smiling when a passenger called for them. I am definitely satisfied with my flight experience, and the enjoyable flying experience on the Airbus A330 has sort of help me got over my disappointment (Not flying on the airline's Triple 7). Unlike my previous flight, I have a window seat with an actual window this time!! Yeahhh! We were all set to go! A Korean Air Airbus A330-300 taxied in, just arrived from Seoul Incheon. 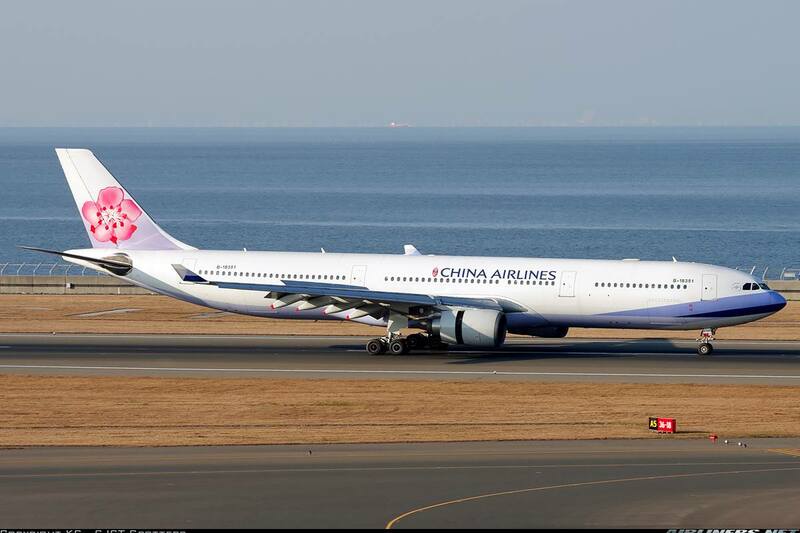 Pushed back and a China Airlines Boeing 777-300ER had to remind me on what I was missing! Grrrr! Spotted the highway which leads to town. The airport vehicle would be where most aviation enthusiasts would like to be - able to snap photos of aircraft. Spotted a FAT's MD-83 which is used for chartered flights. Remote parking lot for EVA Air aircraft. Passing by EVA Air's maintenance hanger and an Airbus A330-200 of EVA Air was spotted. Spotted EVA Air's MD-90 aircraft! What is Mega's Boeing 767-300ER doing here? At the threshold waiting for a couple of departure before our turn. Take off was initially slightly bumpy but it was smooth not long after. It was certainly a good day for flying. The ride got a bit bumpy especially passing through some clouds. Not so friendly skies while our aircraft was on approach to the runway. We touched down nice and soft and taxied to our assigned gate. Eastar Jet, a Korean Low Cost Carrier I rate highly after flying on it twice. Finally after 15 minutes of taxing, we were at our gate. 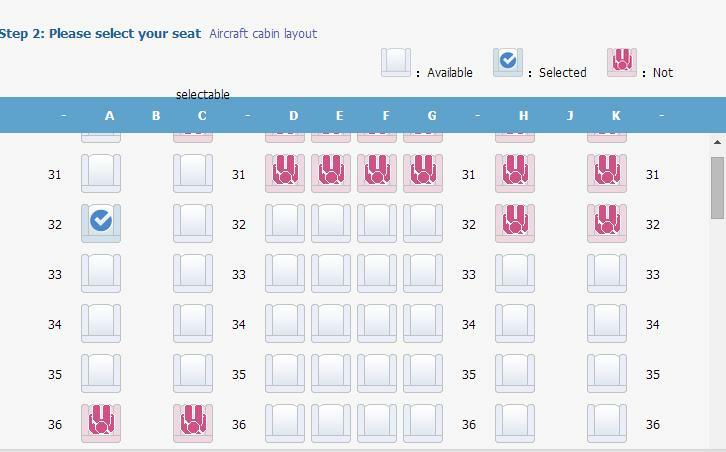 This airline has room for improvement to catch up with EVA Air. 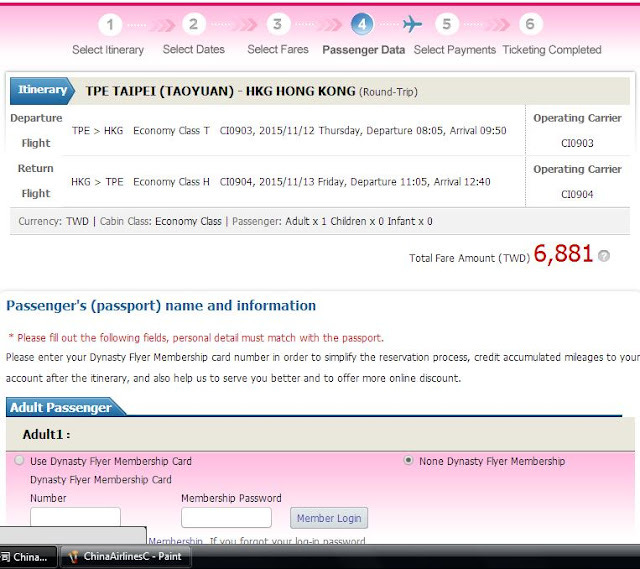 Not being bias, but I find EVA Air better especially the cabin interior, website and mobile app. As I haven't flown on this airline's Boeing 777-300ER, I can't do the comparison between the new products of both airlines. A few things I like China Airlines to focus on is to improve the airline's website and update the current cabin for both Boeing 737-800 or MAX and the Airbus A350-900. The current livery is fine as it is, so is the new set of uniform for the cabin crew. This time my flight experience is better and despite my disappointment on not flying the Boeing 777-300ER, at least I got to experience another aircraft type of this airline. I am not worried about maintenance of this airline as it has improved quite a bit comparing to the past. The subsidiary, Mandarin Airlines operates on domestic flights and selected international routes. So don't be surprised if you book yourself on a Mandarin Airlines flight and find yourself flying on a China Airlines' aircraft. The new website is already online! But only for the U.S. version for now. I heard that all other versions of the website will be updated to this one by January 2016. Hi, that's good to hear.